So Greenpeace is out with with an emotionally powerful ad that takes issues with a deal Shell and Lego signed to sell the toy maker's products at gas stations in 26 countries. The ad centers on Shell's Arctic drilling and focuses on the harm an oil spill could have on the environment. The deal, signed in 2012, is similar to the deal the two had from the 1960's up to the 1990's. The ad, entitled Everything is NOT Awesome, urges people to tell Lego to end its partnership with Shell. 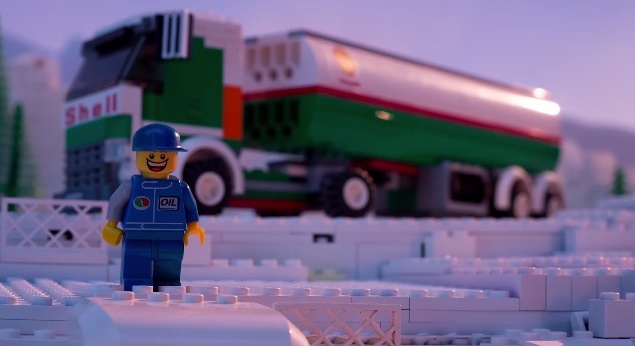 Backed by the Lego movie song, Everything is Awesome, the two minute ad portrays an idyllic setting in which Lego characters inhabit the Arctic in peaceful bliss. We are then presented with a neighboring Shell drilling operation...and an oil spill which quickly turns the idyllic setting black. The ad closes with "Shell is polluting our kids' imaginations" and urges viewers to sign a petition. Obviously, no one wants an oil spill but here's why the partnership between Shell and Lego is a good thing and should continue. If the partnership did end, it would have zero effect on the business Shell does. If they want to drill, they're going to drill, regardless of any sort of partnership they have with Lego. If the partnership ends, the association, if any, between Shell and Lego will end. Kids will no longer associate stopping at a Shell station with getting Lego toys. That's a good thing, right? On it's own, sure. But what happens when those kids grow up, begin to see the world around them and notice the effect companies have on the environment? If they have a strong and positive association between Shell and Lego -- because they received Lego items every time the went to a Shell station -- then if and when there is a Shell oil spill in their adult life, that association will be tarnished, they will be angry and they will be far more likely to take offense and act. Sure, any adult is going to be angered by any oil spill but when such an action crushes a cherished childhood memory, the reaction is likely to be far more intense. And that anger will be directed at Shell, not Lego because it would be Shell that screwed up, not Lego. In the end, Lego partnering with Shell would actually build a huge sleeper cell of would-be activists who would have the strongest form of motivation to take action: a crushed childhood memory.